CASE - The Center helps students (both traditional and adult) improve academic performance through advising, tutoring, and innovative academic programs. Impact Lab - The Lab offers opportunities for multimedia project development, and writing and research support in conjunction with the Writing Center. It accommodates the production of work related to critical and creative thinking in a dedicated environment. Career Services - You'll have access to services for resume writing, interviewing techniques, job fairs, and networking events. Writing Center - Located within the Library (1st floor), the Writing Center offers face-to-face peer tutoring for students' course writing. Writing tutors are available during weekdays, in the evening and on weekends. Online response to course writing is also available for students who are not on the main campus in Romeoville. Students can either make a Real Time Online response appointment or email their paper to WritingCenter@lewisu.edu for feedback. Servicemembers Opportunity Colleges (SOC) - Lewis University are proud members of SOC and provide reasonable Transfer of Credit, Reduced Academic Residency, Credit for Military Training and Experience, and Credit for Nationally-Recognized Testing Programs. Lewis University limits academic residency to no more than twenty-five percent of the degree requirements for all undergraduate degrees for active-duty servicemembers. Academic residency can be completed at any time while active-duty servicemembers are enrolled.Reservists and National Guardsmen on active-duty are covered in the same manner. 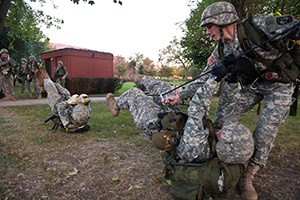 Lewis University awards credit for military training and other non-college sponsored learning activities according to current recommendations of the American Council of Education (ACE). College credits may be awarded for work-related training, professional certifications and licensure earned by the student if the organization providing the training program is recognized by the American Council on Education (ACE), and the appropriate Lewis University academic department determines that the certification/license is college equivalent learning. Student may earn credit for a course by taking a standardized exam, including CLEP (College Level Examination Program), DSST (Dantes Subject Standardized Tests) for active duty military service and veterans, and AP (Advanced Placement Exams) taken in high school. Many students tackle their general education requirements this way. Consult the undergraduate course catalog to learn which exams Lewis accepts.